If the rotary actuator has four 4″ diameter cylinders as shown, what would be the necessary pressure to rotate the shaft with a torque of 5000 lb. in.? Assume 100% efficiency. Also calculate the CIR (displacement). Given: Torque is 5,000 lb. in. Radius of the pinion gear is 2 inches. P = 2,500 lbs. (for two cylinders). Note again that only two cylinders are pushing at a time. Step 3: Find area of 4″ cylinder: A = D² x 0.7854 A = 12.566 sq. in. Deadline past. Not available for submissions. 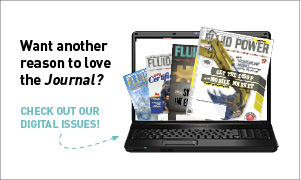 This teaser is printed in the Fluid Power Journal. Those who submit the correct answer before the deadline will have their names printed in the Society Page newsletter and in Fluid Power Journal. The winners will also be entered into a drawing for a special gift.